Evidence of John Fuller, manufacturing superintendent to S W Silver & Company, Silvertown, india-rubber cable makers, to the Joint Committee to inquire into the construction of Submarine Telegraph Cables, on May 19, 1860, #4361. What was this unique umbilical cable? Sometime between February 15, 1859 and September 7, 1859, S W Silver, patentees and makers of india-rubber insulated telegraph wire, made a short submarine cable to run under the river Thames from Millwall to Deptford. This connected the Great Eastern, lying, incomplete, at anchor, and the ship yard that was to finish its construction, intended to coordinate the fitting-out work and the movement of materials across the river. It is reasonable to presume that the instruments used were Charles Wheatstone’s Universal telegraph, a magneto-electric instrument that did not require batteries and indicated the ordinary alphabet on its dials. Silvers’ were shareholders in Wheatstone’s Universal Private Telegraph Company and supplied most of its insulated “aerial cables”. During January 1859 the owners of the Great Eastern completed negotiations with J Scott-Russell & Company to complete and fit-out the hull of the great ship. It had been lying off Deptford since its launch on January 31, 1858, a year previously. 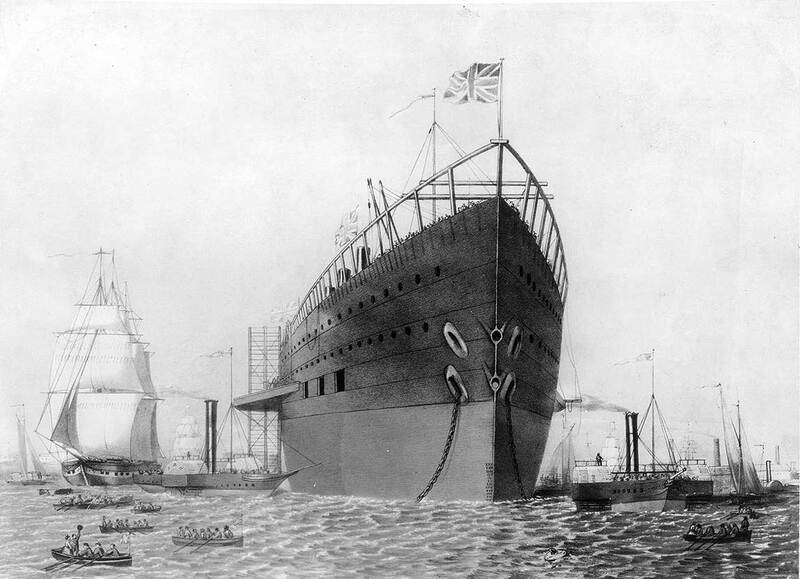 Scott-Russell agreed that all work to ready the ship for sea would be completed in five months. His workers repossessed the bare hull on February 15, 1859. The premises of Scott-Russell’s yard were large, extending for hundreds of yards along the river bank, with separate foundries and engine workshops “inland” on the Isle of Dogs. To connect all these and the hull by electric telegraph was a sensible, unique innovation. Such a communication system had never been implemented before, and clearly the sheer size of the project and nature of the site dictated its necessity. The amount of work required to complete the Great Eastern was immense. Although several large components of both the paddle and the screw engines had been installed in the hull before the launch, they needed to be assembled; and such elements as the forty-ton paddle shaft, the twenty-ton rudder and the blades of the screw had still to be fitted. A newly-built floating derrick, not that much smaller than the Great Eastern, had to be employed to lift these items. Barges and lighters had to move back and forth carrying parts and materials between the ship at Deptford and Scott-Russell’s yard and engine works across the river at Millwall on the Isle of Dogs. In addition, the bulwarks along the hull had to be made, the six masts manufactured, fixed and rigged, the huge hull had to be painted with several anti-corrosive coats, the main deck had to be laid, planed and scrubbed down. A fleet of twenty boats had to be provided and hung on davits and four steam winches each with double cranes for coaling and for loading freight were to be installed. Lungley’s steering apparatus, that indicated by pointers and coloured lights the position of the rudder for the vessel’s captain, had to be produced. All of this was in addition to erecting the partitions for saloons and cabins, their decoration and furnishing. There were three different types of cabin, for parties of six or eight persons; for four persons and the usual double accommodation, with several kitchens, pantries, sculleries, a 100-ton capacity icehouse and wine vaults of a size more appropriate to the hold of a smaller ship. Finally, bales of bedding, piles of furniture, crockery, electro-plate, chandeliers, as well as sofas, dinner furniture, mirrors, chandeliers and carpeting for the saloons, all on an unprecedented scale, had be taken on board. Scott-Russell just met the fitting-out schedule; it is said that the work was scamped. The Great Eastern set out from Deptford on her sea trials on September 9, 1859; one of Scott-Russell’s engine-men omitted to inspect the safety valves in the feed-water pre-heater for the boilers. It exploded, killing several sailors and crewmen. S W Silver & Company were, in 1864, to become the India-Rubber, Gutta-Percha & Telegraph Works Company, one of the major manufacturers of underwater telegraph cables. The Great Eastern, as history loudly recalls, was to be the most heroic of submarine telegraph cable layers, alone connecting Europe, America and India, proving that intercontinental electrical communication was possible. Remarkably, the connection with the telegraph had started with her birth. Sources: The Times newspaper on the fitting-out of the Great Eastern, August and September 1859.